Have you ever loved a hyena? I know this question makes me sound a little “out there” but I still think that not many people would answer “yes”. Well, I did fall in love with a hyena once and I thought the world of the fact that he loved me back. I can safely say it was one of those experiences that leave an indelible mark and if I could go back in time and do it again, I would. It happened in the Bombay Zoo, better known as the Jijamata Udyan. I was working there with People for the Ethical Treatment of Animals (Peta) India, and was second in charge of the Zoo Enrichment Project. The Udyan is principally that-a big very well maintained garden with animal enclosures dotting the zoo. As one would expect, the enclosures have always been an eyesore housing animals living sordid lives in cramped, unclean conditions. Veterinary facilities have only just been expanded there with a hospital behind the main animal enclosure area. That is where I met him first. I was responsible for making my rounds of the zoo every day, ensuring proper food and water for every animal there, making sure that people didn’t tease or hurt the animals in any way and at the end of the day I would go back to office and submit my report. Additionally we were also working on enrichment of the more pitiable enclosures like the leopard cage, the primate cage, the hippo, bear and alligator enclosures to name a few. One day while making my regular rounds, I decided to go into the hospital premises to look at the sick animals there and have a chat with the veterinarians on duty. It was a rather pleasant sight to my surprise-the hospital grounds were clean and the animals well looked after and healing well. After speaking to the doctors about general wild animal health and risks, I went around on my own to “talk” to the various animals recuperating there. I met the leopards and the rabbits, the lion with the hurt paw, the obese monkey who couldn’t move owing to his weight, the other monkey with the food poisoning, the ducks and the flamingos, the demoiselle cranes and the porcupines. As I was about to leave the premises I turned around the corner of a cage which I had earlier thought to be empty save for a lot of golden straw inside. Now as I looked closely, I saw a shape emerge from the straw. A big brown canine, covered with black spots all over (or were they stripes I don’t recall) and the biggest most beautiful dark eyes I have ever seen in my life. I moved closer to the cage and the hyena sauntered up to me and then looked up at me with those liquid pools. And I was a goner. If I had weak knees I would have probably crumpled to the floor in a heap. This animal was one of the most beautiful creatures I had ever come across. Kind of seems like a contradiction doesn’t it? I mean he was a hyena. A much feared animal always related to ugliness and coarseness and meanness. He sure was coarse with the rough brown hair spilling over his forehead into his eyes. But fearsome, ugly and mean? FAR FROM IT! It was love at first sight for both of us. From the first time I reached into his cage through the bars to stroke his fuzzy head, to the many consequent visits I made to talk to him while he leaned against the bars hoping for a stroke now and then-It was absolute magic. The memory I particularly cherish is calling out his name and watching him bound up to me-eyes lit with a fondness that comes with recognition of a long lost friend. And then he would push his snout through the bars and I would hold his face in my hands and give him a big smooch on his nose. Sigh! Heaven on earth! 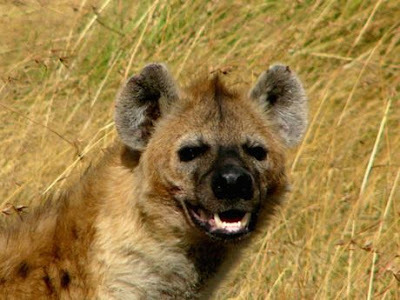 I hear hyenas laugh, but this one used to whine. The frenzy he used to feel every time he saw me come in through the gate would culminate in a series of long whines which would also happen when I had to leave him for the day. Some days I would come in more than once and spend more than normal time with him. Of course he loved it, but it was more than therapeutic for me in a time filled with chaos and passing tribulations. One day, my direct supervisor – in a bid to interact with him decided to feed him glucose biscuits through the bars. And zoo officials caught her in the act, subsequently banning Peta from entering zoo premises again. And that was the last time I saw him. Even if I would come back as a visitor there would be no chance to see him, since the hospital is off-limits to outsiders. In her folly to abuse her authority as a Peta employee, I had to sever contact with one of the most wonderful animals that had ever crossed my path. I have had a lot of animal contact in my life, but this hyena has been unforgettable. I still remember his snout and his big round head, the feel of his rough hair on my hands, his obnoxious odour, his innocent grin and perpetually wagging tail, his big liquid eyes filled with absolute adoration and incomprehensible joy and his echoing whines. I remember seeing him as I turned back while walking out the gate. He was there-snout sticking out through the bars and eyes following my tread, expectantly waiting for a tomorrow that I knew would never come. I loved my hyena. Much more than I can describe in words. In those few days I spent with him, I loved him for a lifetime. I don’t know if he still remembers me, but I know I can never forget. Never. I have always felt that your encounter with the hyena was very unique and beautiful indeed and much beyond words. I have personally felt quite bad about the way your interaction was abruptly ended. I think this piece is well written and hope to see a lot more of such moving pieces in your blog on your interactions with animals, some of joy, some of happiness beyond comparison and some very touching.....all of them bringing out that uniqueness that every animal presents. I am glad you wrote this. Why do I almost choke when you write like that ? Thats one side of me you have never seen perhaps. I knew about this hyena but never it never felt sooo touchy till I read this piece. I wish I could just give him a jadoo ki jhappi too. Twinks this is a very moving piece. I'll always remember it. Keep it up Apple. Papa is with you.